I’ve been fortunate to visit Steve at the winery on more than a few occasions over the last few years for interviews for local wine publications as well as a feature podcast here on Wine Country BC. From our conversations it is clear that Steve is committed to growing fruit, crafting wines, and building his business in ways that take into account the needs and ecological capacity of the land on which he lives along with the impact his business may have on the world at large. He has an awareness of the world that I admire and it is reflected in the business decisions he makes. Somehow he is able to create this little oasis of calm and tranquility that I absolutely love to visit whenever I can. It’s such a quiet and peaceful wine tasting experience and it’s something that I think I can taste when I drink Forbidden Fruit wines. When I recorded the podcast with Steve a while ago, it was a beautiful sunny and warm day in February. The wine shop is right on the Similkameen River with a picnic spot between shop and the first row of apple trees to the north. Usually when I record podcasts on location, I’ll use the tasting bar to set up my recorder because they are at a good height for capturing the conversation. Some wine shops have very good sounding ambiance which makes for an interesting recording. In speaking with Steve about Forbidden Fruit and organics, it seemed silly not to capture that conversation without making use of the natural soundscape of their location. As a result, I was able to capture our conversation with the sounds of the the wind, eagles hunting overhead, and the Similkameen River flowing in the background. They have expanded the Earth Series wines to include other varieties (including a wonderfully aromatic Sauvignon Blanc) and have a large selection of fruit wines (from dry table wines, sweet and fortified dessert wines) which makes for a most challenging tasting bar experience. After a day of tasting grape wines, the refreshing qualities of the fruit wines seem to cleanse the pallet and challenge my vocabulary at the same time. Spend a day tasting everyone’s Pinot Gris, Chardonnays, Merlots, and Cabernet Sauvignons, and the same descriptors will keep creeping in. Taste a sample of the Plum Noir and suddenly all of those words you’ve been leaning on until then will simply not apply. I’ve probably made up more words with Forbidden Fruit’s wines just to describe some of the new tastes that I was expeiencing. 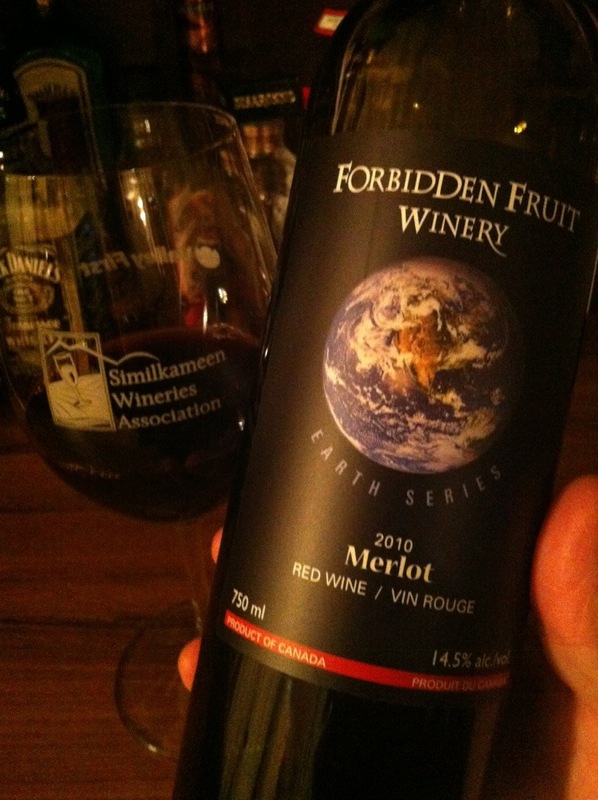 I purchased this bottle of 2010 Merlot on one of my visits to Forbidden Fruit WInery in the Similkameen Valley and these are some of the thoughts that I recall from this bottle. Cheers from wine country!